This corded necklace is made using nylon/spandex cording. It looks very much like suede cording, actually. The length can vary from about 15 to 18 inches with a center jeweled piece that adds 2.5 inches. It is done in a coral, ivory and brown. The jeweled piece starts with a medium-sized carnelian round. 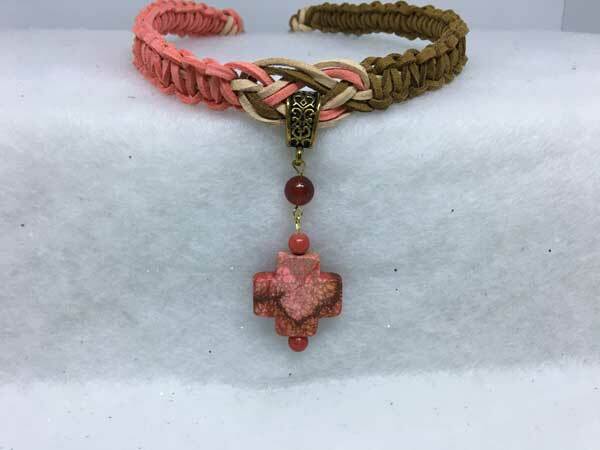 Hanging from that is a gorgeous marbled stone cross in light and dark shades of coral with some of the same brown as the cording. The cross is surrounded by 2 small coral quartz rounds.